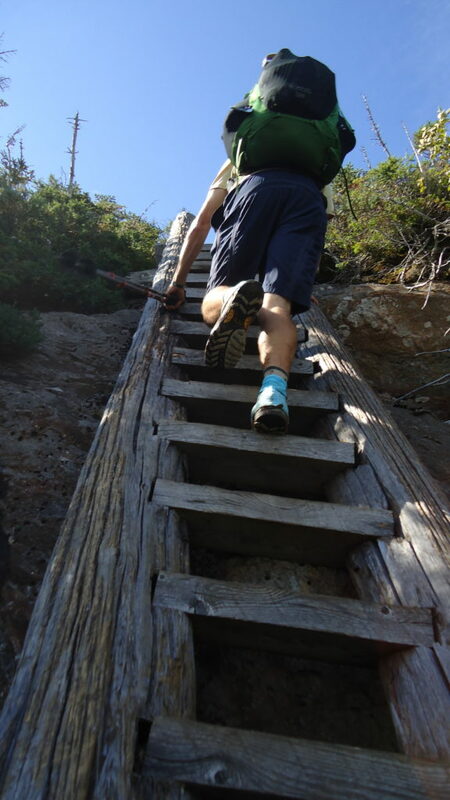 From our site at Dream Lake (mile 1900), we crossed several streams and up to Mt Success. Shortly after, we crossed into Maine! The Goose Eyes were our first set of challenges- 3 peaks, all of which had 360 degree views. Mahoosuc Notch is the single “most difficult or fun mile of the AT” according to our guide book. It is a boulder field with steep sides that hikers have to navigate through to reach the Mahoosuc Arm, a steep climb up bare rock with little to hold on to for balance. It’s not over there- after a quick dip down to Speck Pond, Speck Mountain awaits. Finally, the trail descends down to Grafton Notch, the first of few paved roads that hikers will hit in Maine. The Baldpates (West and East) were incredible slabs of rock with 360 degree views of rugged Maine mountains. Andover is the first trail town in Maine. Wyman Mountain and Moody Mountain follow. Views from Old Blue Mountain and Bemis made the climbs worth it. Height of Land view featured Toothaker Island and Mooselookmeguntic Lake. Sabbath Day Pond had a nice sandy beach for swimming Little Swift River Pond had canoes! The Saddlebacks were our next set of mountains, each featuring 360 degree views. They consist of Saddleback, The Horn, and Saddleback Junior and descend down to Orbeton Stream. Lone Mountain, Mt Abraham, Spaulding, and Sugarloaf are in the dense forest close to where a 2013 AT thru-hiker became lost and died. A bronze plaque marks the completion of the trail in 1937. (At that time, the trail was 2,054 miles. It tends to grow every year due to trail work and the addition of switch backs.) South Crocker and North Crocker were moderately hard but have a steep decline before Stratton, Maine (mile 2,000). Stratton offers a great view of the Bigelow Mountain Range, which we decided to traverse in one day. This included a climb of Bigelow, Avery Peak (named for Myron Avery), and Little Bigelow. The trail leads to East Flagstaff Lake, Jerome Brook, and follows the Great Carrying Pond Portage Trail where Benedict Arnold led his troops to Quebec in 1775. West Carry and East Carry Ponds were truly lovely. It is a plush trail down to the Kennebec River, home of the mandatory (and super fun) canoe ferry. The trail skirts Caratunk, ME before heading back into the woods to Pleasant Pond and Pleasant Mountain. Moxie Pond was at the base of Moxie Bald where we had our first distant but distinct view of Mount Katahdin. Our first real AT ford was of the East Branch of the Piscataquis River. Most of the other fords have been rock hops due to the looming drought. Finally, we passed Lake Hebron and hit the trail head near Monson, ME, the beginning of the 100 Mile Wilderness! This sign, and Lollygag’s map show we’re in Maine! Springer is below his knees on the map. No pain, no rain, no Maine. 282 more miles of rugged and remote wilderness! Hitched a ride with Shepherd, Odie, and Leave No Tracy in the Hiker Yearbook short bus! It’s funny how certain points on the trail are renowned, and we look forward to them for sure, but there are so many other amazing places on the AT. We had never heard about Goose Eye Mountain, and were excited to get 3-360 degree views of Maine! We could see the trail tracing between the 2nd and third peaks from the first peak. We only passed a handful of hikers in this section, and had the peaks to ourselves. Southern Maine has amazing views, but they are so remote that few others come out. 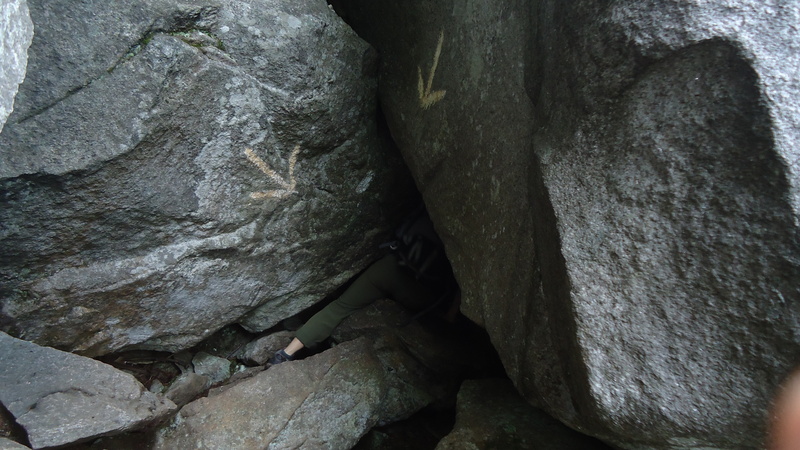 The most feared and anticipated points on the AT in Southern Maine are Mahoosuc Notch and The Arm. When we got to Full Goose Shelter (last shelter before Mahoosuc) we were warned about imminent rain from the folks inside. They shuffled over for us and we set up inside the shelter just in case. It’s great that we didn’t have to ask anyone to move, they offered! This isn’t unusual for the trail, but it is good to appreciate people being nice to each other! We all talked about the Notch, what rumors we’d heard about it, about the man who fell and dislocated his shoulder earlier that week, and decided to quit the trail right there, over 1,900 miles in! We met him in Gorham the day before, and tried to talk him out of leaving. His mind was made up about leaving, but he did give Lollygag his compass! Talking about the Notch gave us a feeling of camaraderie; we were going to suffer together! The group included a physician and a dietitian, so we figured we could handle anything it threw at us. Hiking the notch was fun! We were not in a hurry, went with a group, and thought of it more as a mile of bouldering rather than hiking. The hardest sections for Lollygag were those that required crawling in tight spaces. He is tall and has a hard time turning around, and at times had to shuffle on the gravel since there wasn’t enough space to get on elbows and knees. These parts were short though, and the rest of the notch was enjoyable but tiring. For Little Rhino, the Notch was a culminating experience of all of her favorite hobbies from the past 15 years or so. 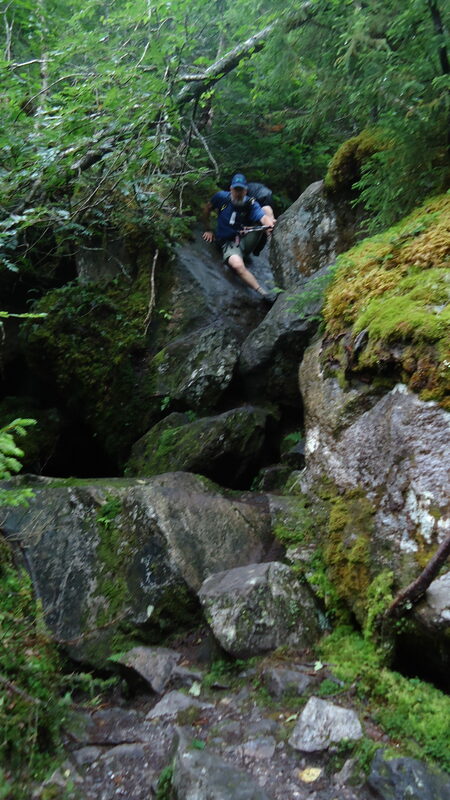 (Backpacking, climbing, caving all in 1!) The ARM is a sheer granite slab going straight up Spec Mountain. It had rained the night before, so everything was wet, but granite offers surprisingly good traction when it’s wet. The Baldpates are another Maine beauty! There are 2 granite peaks with a dip in-between. The trail is exposed the entire way, and the weather was clear, so we had views the whole way. At the first peak we decided to cross to the 2nd peak for lunch. It was windy on top, but worth it to sit with a wide open view. Our friend Griz, who we last heard was getting of the trail, joined us for lunch! After seeing several people quit recently it was heartening to see someone stick with it! Maine is known for having the best swimming holes, ponds, and beaches along the trail. We took advantage of them almost daily. (Counts as a bath, right?!) One spot even had a couple rickety canoes and paddles. Griz sat in the back, Little Rhino sat in the middle to watch the crack and alert the crew if too much water was getting in, and Lollygag used the only paddle we had to power us around the lake. It was a spontaneous mid day cruise and made us feel alive. Throughout our time on the trail, we continue to be amazed at how generous people are to us! For example, in Rangely, we received a 10 mile ride into town without even hitching and a ride back out of town without even asking. People would approach us and ask us if we needed a ride. What a welcoming community! Also, outside of Stratton, we received a word of mouth reference to stay with a trail angel named Tom. We called him up and he met us at the end of the day. He is from Maine and retired from the Coast Guard. 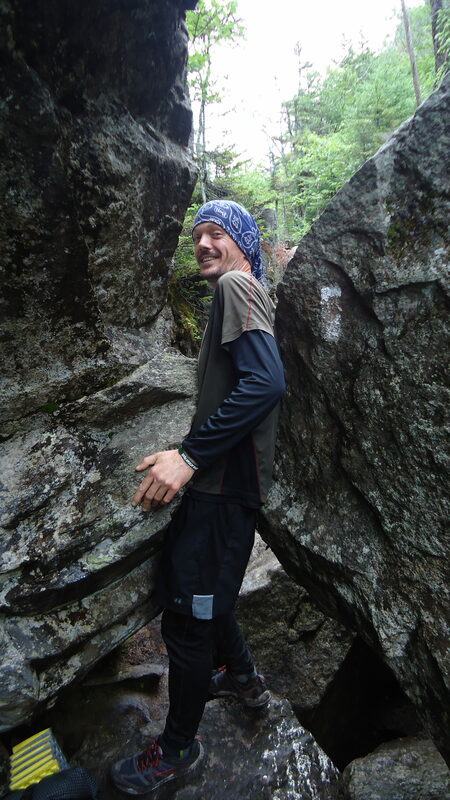 He takes pleasure in cooking elaborate meals for thru-hikers and allows hikers to stay in his home. Rumor has it that he will allow you to stay for up to 30 days! We had our own room and we were welcomed to shower, do laundry, and relax on his deck. In the meantime, he prepared a full lobster dinner! Each of us had our own bowl of butter and he provided us with step-by-step instructions on how to crack and eat lobster. We had so much fun! After having lobster, we also had chicken fettuccine alfredo, Caprese salad, and grilled asparagus. For dessert, he brought out several kinds of ice cream and toppings. 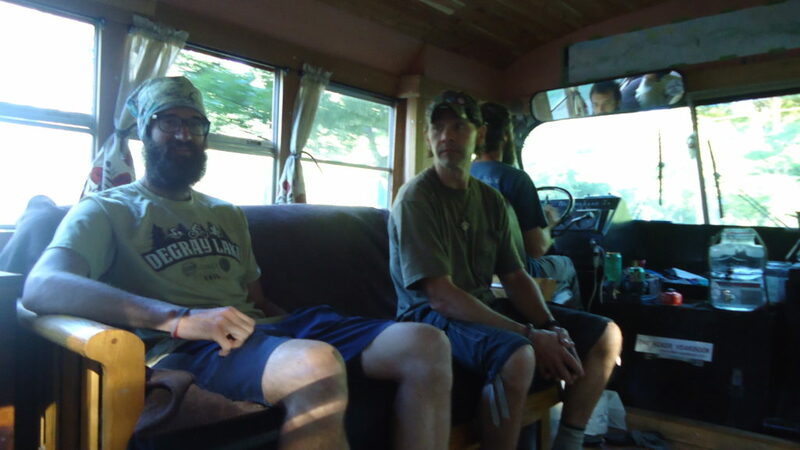 In the morning, he prepared a full breakfast for the hikers only and drove our friend, King Tough, all the way to Portland to purchase a new pack. His openness and generosity to strangers is such an inspiration! From there, we decided to do a full traverse of the Bigelows! Sometimes we get ideas in our heads… Whether they’re realistic or not, it can be hard to let go of a challenge. After staying with Trail Angel Tom, we realized we could get an early start and traverse the Bigelow range in one day! It’s a beautiful section, with the trail climbing up above tree line and following a ridgeline for several miles. There were several options to stop for the day in-between peaks, and despite the sun going down and our legs ready for a break, we couldn’t let go of the idea. Little Bigelow is much more difficult than it looks on paper! The best park of hiking late is watching the sunset from the trail. (See featured picture on top of article.) We stopped every few minutes to watch the alpenglow light up the mountains and ask each other why we didn’t stop at the last shelter! We got into camp after dark, ate a cold dinner, and slept like babies. 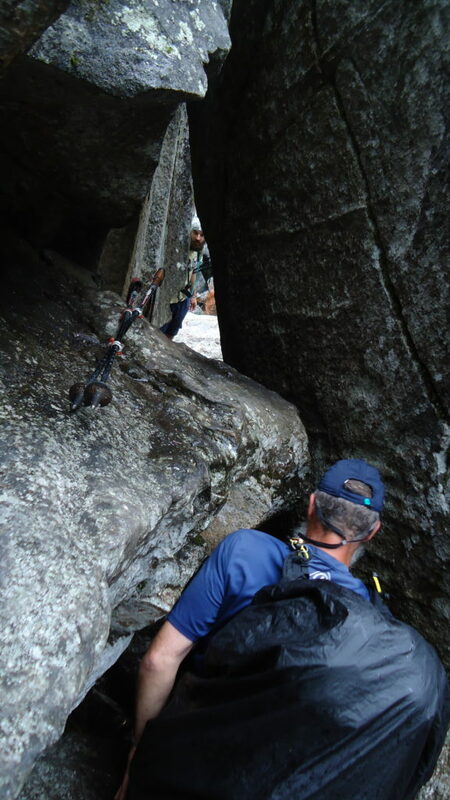 FOB trying to reach Lollygag on the other side of a rock puzzle. 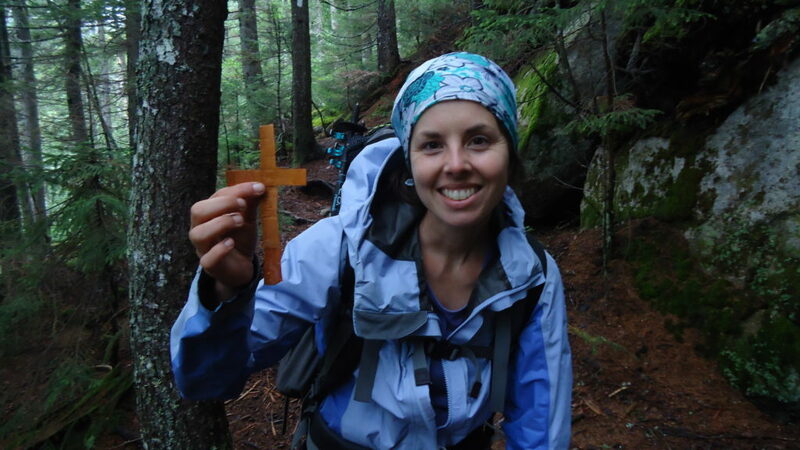 Months of hunger assist thru-hikers with surviving the Mahoosuc Notch! Red Wing ended up breaking his arm during this stretch (further injuring a sprained wrist from the Whites). Spoiler alert: Red Wing finished the trail with his broken arm on the same day as us, September 10th! 1.25 c rice, 3/4 c black beans, 3 Tbsp dried tomatoes, 2 Tbsp garlic/onion, salt, pepper, and sage to taste; Saute 1 cup cashews in 1/4 cup olive oil- pour on top of cooked dish. Fry pepperoni slices until crispy. Combine! 1 pkg Knorr’s beef strogonof, 1 pkg Knorr’s mushroom rice, 1 packet mayo (add more if you have it), 2 Tbsp fresh onions (trail magic), 1 fresh home-grown tomato (trail magic), top with olive oil and cheese. In separate pan, fry 1 pkg Spam. Dice up and add to main dish. Our last night in New Hampshire, we saw a moose! We found a stealth sight near Dream Lake after leaving Uncle Dave’s house for the second time. As we were cooking dinner a moose walked out into the lake on the far side and hung out for about 30 minutes! The next morning at breakfast it happened again! We honestly felt a little relieved to have “moose sighting” checked off the list so early on in Maine. We were surprised to still see snakes out in Maine with the cooling temperatures. We saw Milksnakes, Ringneck snakes, and Ribbon snakes. Unfortunately our Maine snake pictures are all blurry. We had some great bird sightings between Pierce Pond and the Kennebec river. We saw Loons, a Bald Eagle, a Pileated Woodpecker, and a Kingfisher- all in 24 hrs! We camped by the shore of Pierce Pond, and saw Kingfishers and a Pileated Woodpecker while eating dinner, and heard the mystical call of the Loons during the night. The next morning we saw a bald eagle on the Kennebec river while waiting for the canoe ferry. The canoe captain said they live there and he sees them every day! Don’t worry about Mahoosuc Notch! Just take your time and it will be fun. If you get stuck, re-trace your steps and look for a blaze or arrow. Harrison’s is worthwhile. When you’re at Pierce Pond Lean-to, walk down to Harrison’s and reserve a spot for the morning. (He has tap water so bring your bladders and he let us send 1 person rather than everyone having to go to RSVP.) Breakfast is served at 7 am. The owner prepares 12 pancakes per person! I could see a waterfall from my seat in the dining room. He is a gifted musician and played us songs on the piano all morning. Cash only. Andover is not that great and Rangely is amazing! They are both small towns but Andover is an overpriced, not very exciting small town whereas Rangely is a small resort community with incredible views of the surrounding lakes and mountains. They are only 2-3 days apart and we wish we would have stayed in Rangely instead of Andover. Also, note that the best resupply option in Andover (we shopped around…) is a cabinet of food on the porch of Pine Ellis. Prepare to be under-whelmed. Our favorite outfitter in Rangely is Ecopelagicon. They have a great selection and the owner is awesome. She ended up giving us a ride back to the trailhead at the end of the day. Little Swift River Pond south of Rangely is in need of supplies for canoe repair (both leak and one has a giant crack down the middle) and other gear such as paddles, life jackets, etc. If you’re looking for a fun way to help hikers, this could be your project! There are plenty of places to camp in the Bigelows. Don’t feel pressure to do them all in one day. Awesome stealth spot at “Woods Road” North of Saddlebacks. The camping spots are on the top of a waterfall, which doubles as a great water source. The spots are flat as can be because it used to be a road of some sort. Caratunk B&B House is not in the guide book but is a must stop! It’s only 1-2 blocks off the trail on the main road in Caratunk, population 55. You can’t miss it. 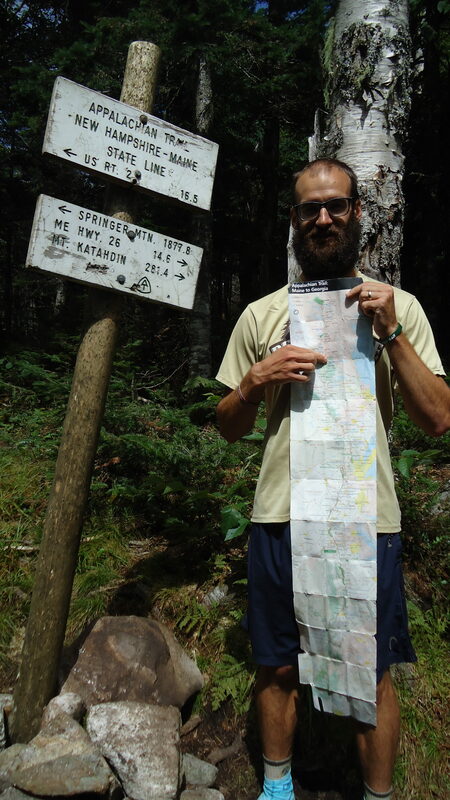 The owner, Paul, has hiked over 10,000 miles and knows what hikers want and need. Cheeseburgers and milkshakes are $4 apiece. Inexpensive rooms and a nice place to hang out. I found this lovely bark cross on the trail. It aided in refocusing my mind and walk on what’s really important. Maine doesn’t believe in switchbacks. Instead, we go straight up every mountain. They have built ladders and stairs in several sections. We became AT thru-hikers in 2016! We loved life on the trail and didn't stop there. New Zealand was calling and we listened. For 3 months, we volunteered on local farms and hiked many trails on both islands. Now, we're section hiking the Ozark Highlands Trail and have launched a business called Charge the Trail: Nutrition for Long-Distance Hikers. You both have done amazing!!! It has been wonderful living through your hike with your posts. Sounds like so much fun. Congratulations on your accomplishment! Thank you!! We’ll post 1 final update soon- we finished the hike but not the blog! I’m going to stop by UAMS next week sometime to see everyone! Great read!! Thanks for the info! My turn is in 2017!!! You have been busy! We met another AT hiker from ’96 in Little Rock last night. We’d love to join you for a week or so on the OHT. Looking forward to our next adventure!